PICKING UP MARBLES WITH MY TOES! At the physical therapy place I've had to pick up marbles with my toes for the past four weeks. My therapist says it's very helpful for the healing and strengthening of my broken ankle. In the beginning I found it an impossible task as well as an embarrassing one - I just couldn't get my toes around the d--- marble to pick it up and drop it in the box. I hated it. I hated having to try and get my toes around those slippery little spheres to no purpose it seemed to me. How the heck did this dumb exercise help my broken ankle I wanted to know? They said picking up marbles would improve the mobility and flexibility of my ankle so I continued to try. But I have to say it was the most annoying, frustrating thing I'd had to do in a long time. I was tempted to refuse to do it but I held off, and soon I found I was able slowly to get it done. Of course I got better and better at it as any physical therapist would tell you I would. Today I was told I was ready to move on to bigger and harder things (harder?). That today would be the last day I had to pick up marbles with my toes. Interesting therapy. Marbles are slippery, it must be challenging. That's great, that you can make physical therapy into a cool post with a great photo. 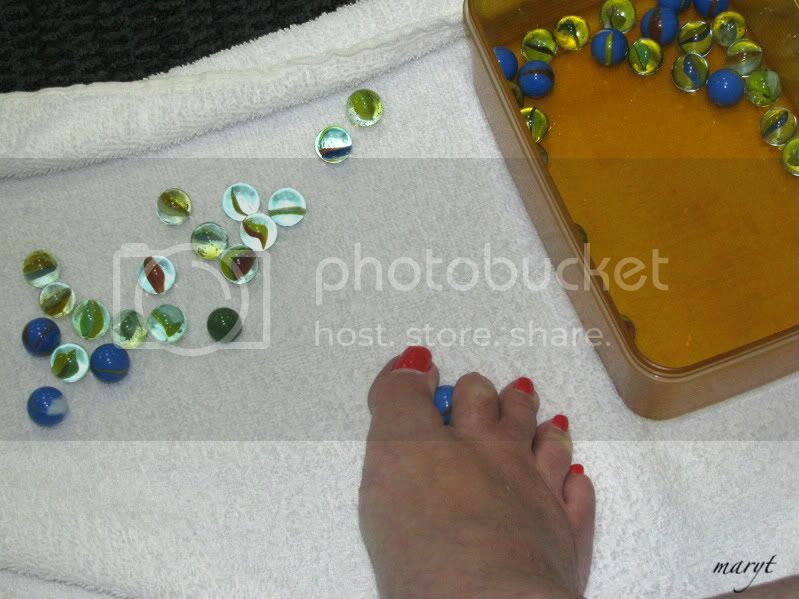 The colorful marbles work well with your painted bright red toes. Glad you have the opportunity to vent a little, too. I broke my ankle way back when. Didn't have to do anythig like that. Just twirled my foot around getting the flexibility back. Nice photo though. Sort of like making lemonade out of lemons - things are sweeter when you pretty them up. Ha Mary... good for you. Congratulations. At least they didn't expect you to put the marbles in your mouth to improve speechifying. I love the new photograph ... another library to drool over. You go girl!! It's a lot harder than it looks but very therapeutic. Ya know Mary if you a lazy streak in you that was so refined such as myself you would know how to pick stuff up with your toes simply out of a lack of desire to bend! LOL! Been doing it for years!!!! So, will you have to pick up things that are larger and harder than a marble? Must be great big diamonds...now that's success! hmmmm i wonder whatever could be next? Next week golf balls! LOL. I think that any exercise that gets the muscles in the foot to work will help. Well, I would have failed because I couldn't pick up marbles with my toes to start with! Glad to hear you're getting better!